What's changed in bike design since ... forever, that makes the bike itself safer? I wouldn't count accessories as those would apply to any design (lights, helmets, hi-viz etc). For those wanting a bit more background, click forward to 1:09.20 and you get a decent introduction. The question that comes out of this, though, is what Corporates do we know that it suits to support this idea? Infrastructure, infrastructure, infrastructure. 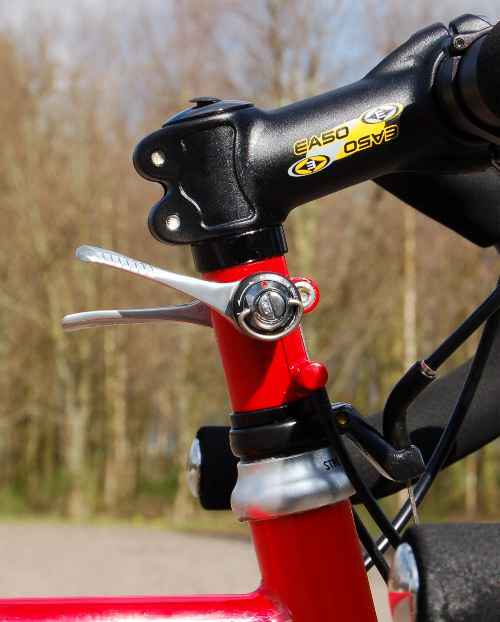 Bikes are plenty safe enough as they are, and anything else is fiddling around the edges. The only people with a vested interest in suggesting otherwise are snake-oil salespeople and the motor industry. "It has not undergone the same rigorous crash-testing and safety improvements as the automobile. This may be why only 14 million Americans ride their bike at least twice per week." Are they seriously suggesting designing a "bicycle" that can protect the occupant from a collision with the thing most likely to hit it - an automobile? Good luck with that. If you exclude recumbent geometry (covered in the other thread), you're down to things like improved and/or more reliable brakes. So alloy rims and disc brakes, I suppose. I don't think anything revolutionary (rather than evolutionary) has happened in tyres since they went pneumatic. I wouldn't really count lights as accessories - at least on bikes designed as a means of transport rather than a piece of sports equipment. In which case LEDs have made a real difference to performance and reliability, but it's debatable how much of a safety benefit that actually gives (there being minimal evidence that lights reduce collisions with motor vehicles, and being able to see better in the dark generally just means you can ride faster for the same risk level). I think I've got 2 points to make about the replies, the latter also being about where I was trying to get the conversation going. All are linked, so let's have a go. 1. Assumptions about Infrastructure being the main effort mirror the road safety establishment as it was from the 1920s ref car safety. Their take was the 3Es, Education, Enforcement, and Engineering. First 2 were about the driver, and the third about the road. We do bang on about those, and they have their place for sure. But we ignore an aspect [bike design] we might be able to improve on, no? 2. Not sure the bike can protect a person from a 50mph side-swipe, but there are various common 'failure modes' of when and how people come off bikes or hit/are hit by something. I've had my fill on DF offs and they nearly all have a common outcome of trying to avoid head on concrete from height. Bents have different angles and shapes to deal with, so the scientific rigour could well be applied there with the right historical data feeding the tests. We might end up somewhere totally different to either, that's the fun of it. They are considerably more reliable, faster and cheaper now, than in any previous decade. So it is easier than ever to get the health benefits. I'm not sure the comparison between cars and bikes is a particularly good one; the obvious difference being that, with the various propulsive improvements over the last century, cars can now weigh what, 3? 4? times what they used to at greater P/W, and that leaves a lot of space for safety equipment. With human power limited to 100-150W (assuming we're talking about mass cycling here; and if not, why bother? ), even the efficiency gains from recumbency are unlikely to give you much of a power budget for active safety systems. And this ignores issues of cost, never mind the (admittedly possibly niche) philosophical appeal of the bicycle's simplicity. Nonetheless, I would stand by the infrastructure point; Dutch cycling KSI rates are AIUI pretty negligible, though they start to rise in the elderly, who are more likely to fall off their bikes. This might be something to look at, but as a trade-off the net health effect of increased cycling rates is still overwhelmingly positive. The point about whether recumbent geometry is safer is potentially an interesting one: does the lower position more than compensate for the greater KE of the faster machine? I don't think it's so much height above the ground, as the way the recumbent geometry becomes unstable in crashes: DFs are prone to chuck you over the bars so you land on your face, or your outstretched arm, leading to the classic broken wrists and collar bones. Recumbents are more likely to slide out sideways, so you hit the ground sooner at lower vertical speed, typically leading to bruised hips and elbows and a whole load of road rash. Brakes are a lot better. Anyone here used brakes on chromed rims in the wet? Modern LED lights are a huge improvement. Being able to see potholes, kerbs, etc are a big advantage in avoiding accidents. I stopped listening to the video when he started going on about the UCI and recumbents. You are never going to fit recumbents on the underground, on buses. I suspect this guy has never seen a Brompton, for example. Presumably darksiders are able to brake at higher Gs without going over the bars? In the dry I can see that being a safety benefit. Yes. Although they're not always completely immune. Tadpole trikes will try to embed their chainring in the tarmac, which is mostly harmless (unless there isn't a chainring guard). I once properly endoed my Streetmachine in an emergency stop; I landed neatly on my feet with the bike collapsing awkwardly behind me. If the weight distribution isn't conducive to endoing, the front wheel(s) will eventually skid and on a bike that tends to mean you go down sideways and some of your skin comes off. TBH, I think the superior braking tends to lead to risk compensation, by way of higher speeds. Or, to put it another way, when I get on an upright after prolonged recumbent riding, it takes a while to get over the feeling that I'm going to land on my face as soon as I touch the front brake. AIUI this guy is in the industry (ETA: He appears to be one of the founders of Cruzbike), and it's therefore entirely reasonable that he talk about recumbents in a video about recumbent cycling. I don't think there's anything unreasonable about promoting recumbents in contexts where they're practical. Why shouldn't recumbent riders have race categories to compete in? They're excellent for touring and endurance riding. They're the only option for some people with disabilities. They can be awesome fun. It doesn't matter that it's easier to make a good folding bike with a saddle and upright riding position, or that DFs are better for off-roading, or that some 'bents are a complete pain to transport under anything but their own power. Best tool for the job just means you need a wider variety of tools. The idea that you might be able to sell the idea of recumbent (or some other unconventional geometry) cycling to people based on the bikes being safer than a functionally equivalent upright isn't entirely stupid (just IMHO wildly optimistic). But in order to do that, you first need some evidence, which is what he seems to be proposing. Sure, why not? Meh. The idea that you might be able to sell the idea of recumbent (or some other unconventional geometry) cycling to people based on the bikes being safer than a functionally equivalent upright isn't entirely stupid (just IMHO wildly optimistic). Someone did once start a business to make a conversion kit to turn a Brompton into a recumbent. Folded, it was scarcely any bigger than the standard item, and a quick spin around the block outside Bikefix showed it to ride surprisingly well too, bearing in mind that I was wearing the wrong shoes and the bike's owner is about a foot shorter than me. But they weren't able to sell enough to make a go of it. Sure, but safety bicycles are also easier to ride and allow for higher gain ratios than ordinaries without resorting to ergonomically silly crank lengths, as well as being more conducive to adaptation for carrying luggage. Perhaps those practical advantages were more of a driving force than the safety benefits? I've seen pictures, and it's impressive. I suppose the problem is that recumbent-aware Brompton enthusiasts (there does seem to be quite a lot of overlap) are happy for the Brompton to be their token upwrong, because (assuming you have the choice) the upright position is actually quite good for short-distance city riding. A lot of people seem to have forgotten, or don't know, the trick of not over-tightening stems and bars, so that they will move in a crash. They worked well enough when the water had been shed, which obviously could give a very long stopping distance! In town, the trick was to keep the pads as close to the rim as possible when riding to keep them dry/warm as possible. People complain about cantis but I have made some very impressive emergency stops with ordinary Shimano cantis with decent blocks. A problem that bikes used to suffer from was shimmy. For years I endured a 1985 tourer that could suffer from it and at last the only component left from the original were the Campag hubs which were eventually ditched to switch from freewheel to cassette hubs. Once I'd got modern hubs the bike never shimmied again. Other than all the above, I'd say it's not really down to bike design, more about improving the road environment and rider competence, both to ride the bike and keep it maintained properly. For safety bicycle you could read modesty bicycle, since ladies couldn't possibly be expected to endure such heights and speeds and potential ankle-flashing on an Ordinary. And then pneumatic tyres were invented and suddenly you didn't need an Ordinary to go fast. To be fair, the ankle-flashing problem is even worse on recumbents. Attempt to ride one of those without the aid of rational dress and you're liable to impair your (but unfortunately not everyone else's) vision, and/or suffer the worst kind of bee attack. The modesty bicycle is clearly the optimal design in that respect, unless you include the unicycle-concealed-beneath-layers-of-crinolines option. *Most of know someone who has ridden about 150,000 miles in 3 years on one. There can't be much wrong with the design because that's more than 15 years driving for me. That's perilously close to the "somebody's done PBP on one" argument, thobut. Looking back on 50 years of riding I would say that the improvements that made a difference to safety are lights, brakes, rim materials and so forth. Bike design and geometry are another factor. In my view , a safer bike would be a tourer , roadster, Raleigh 20 or a 1st generation MTB.